From about 1837 until 1850, more than a quarter million buffalo robes bought from Indians and 27 tons of fur company trade goods were hauled over the 300 mile long Fort Pierre-Fort Laramie Trail that followed the White River through this area. First used by the American Fur Company, the trail had its origin as part of an earlier Spanish trade route from Santa Fe to the Missouri River in present South Dakota. 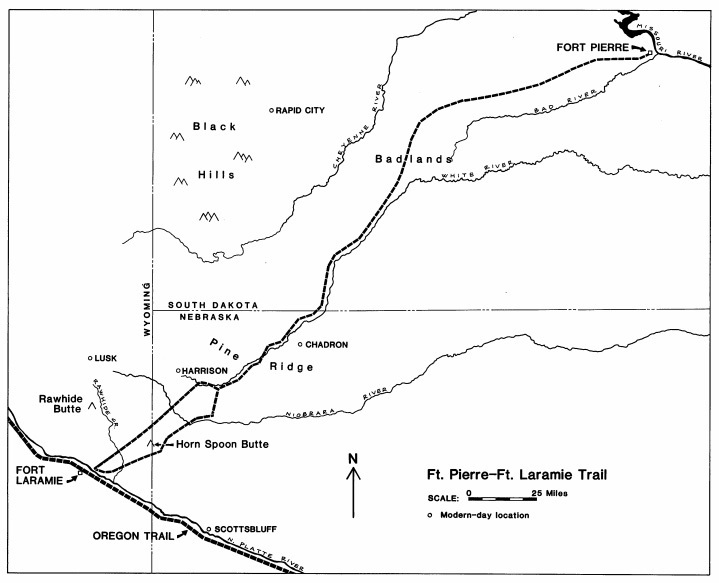 During the 1840s the Fort Pierre-Fort Laramie Trail was the shortest overland connection between trading posts on the Platte and steamboats plying the Missouri. After the government purchased Fort Laramie in 1849, Colonel Aeneas Mackay and Captain Stewart Van Vliet with ten mounted riflemen traveled the trail to Fort Pierre. General William S. Harney's troops marched over the route in 1855, and the trail was mapped by Lt. G. K. Warren of his staff. Small traders and government freighters continued to use portions of the trail until the 1880s. Ruts from the passage of thousands of carts and wagons can still be seen in several places between Fort Laramie and Fort Robinson. “The Fort Pierre-Fort Laramie Trail,” Explore Nebraska History, accessed April 18, 2019, https://mynehistory.com/items/show/117.